Shwick Market is Closing This Weekend Due to its Unsustainability "As Is"
If you got used to swinging by at Shwick Market after your weekend brunches than you will be really bummed by the news that Shwick is closing. 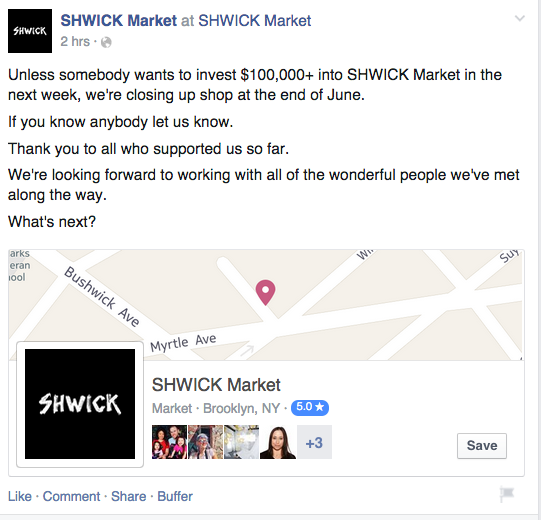 Jinyen and Christopher Carew, a husband-wife duo who has been running a "market of makers" since October 2014, have announced on Shwick's Facebook page that the market will be closing this coming Sunday unless "somebody wants to invest $100,000+ into SHWICK Market in the next week." According to Christopher Carew the market is not sustainable as is. "We are currently seeking quality opportunities. We look forward to working with some of the wonderful people we've met along the way," he added. Shwick is not actively seeking investors although, "if somebody wants to make it happen, we have some nice ideas," Christopher told us. Besides offering an indoor space to local vendors, Shwick has been very active throughout the months of its existence throwing events, workshops and art shows. In March the couple announced their intention to open an outdoor food garden, "a mini Bushwick Smorgarsburg," but the plans never materialized as not enough food vendors signed up. The Shwick owners are also the founders of Class Attire, the company which created The Chalkboard Tee. Shwick (6 Charles Pl, Bushwick) is open on Saturday and Sunday 11AM to 7PM. Sunday, June 21, is their last day.